Cooling Temperatures Don't Mean You Have to Stay Inside! ​The sun is setting before 5 p.m. It's cold out, like, all the time. You might be thinking that winter is when you officially have to retire your outdoor furniture and move the party inside—at least until May. But we think that with the right accessories—think wool blankets, faux fur pillows and a fire pit—you can enjoy your outdoor space well into the fall and winter, and hopefully all year long. We found 10 cozy, stylish accessories to add to your patio to make it a haven for gathering with friends or just relaxing with your pets and kids all winter long. The first and most essential part of a winter patio is warmth! And to us there's no better place to gather in the backyard or on the patio than around a fire. 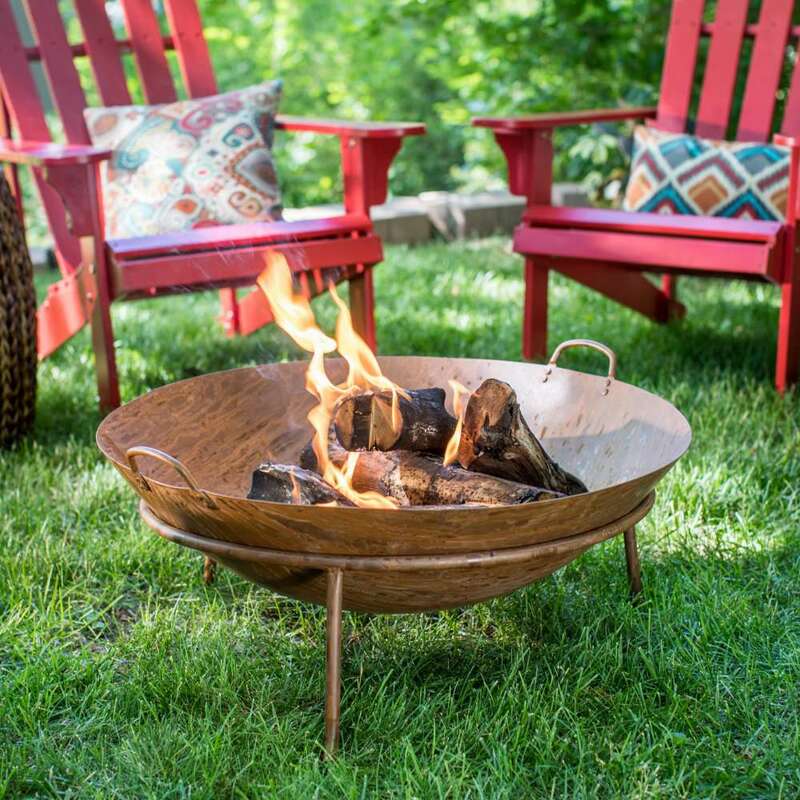 Luckily, adding an aesthetically pleasing and easy-to-use wood-burning fire bowl is an affordable way to extend the outdoor season at your home. We love this copper version from Hayneedle that's only $80. For anyone with a sweet tooth, saying goodbye to s'more season when summer is over just isn't an option. Keep the toasted treats coming all year long with this genius roasting tool from Terrain! Simply stack your sandwich in the basket, close it and hold over the fire to melt your marshmallows and chocolate to perfection. While it's true that these lovely faceted lanterns can work on your outdoor patio all year long, we think their brass and glass design makes them the perfect complement to seasonal accessories like evergreen garlands, colorful lights and faux fur throws. We love the sophisticated simplicity of decorating outside with branches adorned with twinkle lights. These branch lights from Birch Lane would look amazing layered together in a vase or planter, especially framing a doorway or entry. When temperatures start to cool down but you're keen to keep the outdoor entertaining options open, switch out your summer throw pillow covers for cozier, warmer versions—like these faux fur covers from H&M that are just $18 each. Ready to get serious about your winter patio game? Then it's time to invest in a propane gas heater. These powerful heaters (that you often see at outdoor weddings and restaurant decks) will turn your backyard or patio into a toasty warm winter haven, perfect for entertaining guests with hot cocktails and cocoa. 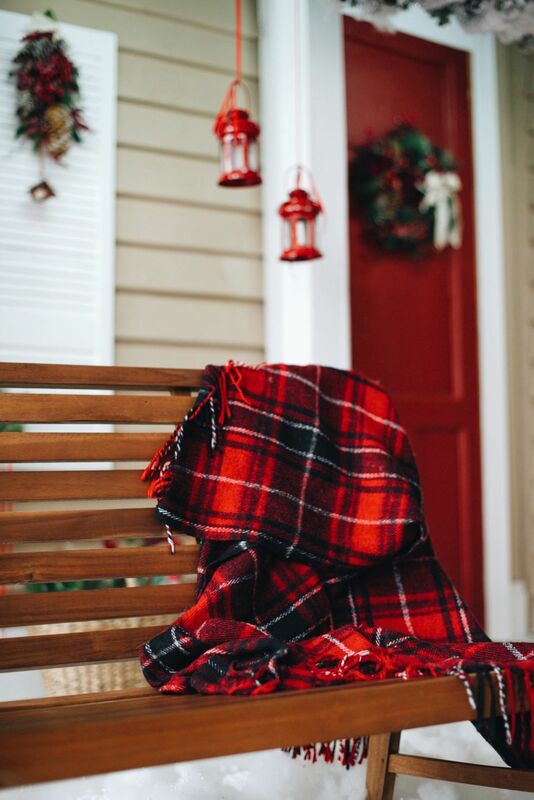 To keep yourself and your outdoor guests comfortable, have some festive and warm blankets at the ready. We love Pendleton's iconic Native American-inspired prints, which will go perfectly with those H&M faux fur pillow covers and copper lanterns. All these elements together will create a virtual winter wonderland in your outdoor space. Glassware in the great outdoors (even if your outdoors aren't technically that 'great'), can be a risky move. To keep your hot cocoa and hot toddy's where they belong, we love these enamel mugs from Best Made Company. Bonus? They'll work as well on your next camping excursion as they will on your patio. If you can't make a fire pit work in your outdoor space (perhaps it's just a terrace attached to your apartment), that doesn't mean you can't get that delicious, woodsy smell when you're getting cozy outside. Once you have your blanket and a hot cocktail in hand, light this affordable Brooklyn-made candle and let the campfire vibes wash over you. Now that the sun sets even earlier, you'll need to get your outdoor lighting going a bit earlier. The light from your fire pit will provide some glow, but stringing a few strands of outdoor lights (sometimes called Edison bulbs) will add an element of style (and crucial additionally lighting) to your patio setup. If you're in the mood to splurge in order to make your patio winter-ready, consider investing in a whole new chat set—we love these wood Adirondack chairs set around a fire pit—all of which comes together, ready to enjoy. To create the perfect warm winter glow, adorn your patio table with tons of candles. For a truly "warm" tone, use brass candlesticks, like these we found from Serena & Lily. Don't you know that a lounger is great for more than catching some rays? Wrap yourself in a wool blanket, get cozy with a faux fur pillow and gaze up at those winter constellations as the fire pit keeps you warm. What could be more dreamy than that? What's a Yellow "Bug Away" Light? What is an Accessory Building Used For?